To refer to this web file, please use "bermuda-online.org/shorts" as your Subject. Bermuda is the only place in the world where they are the national dress for men. 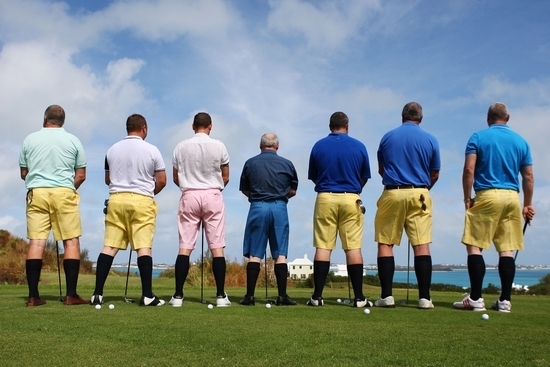 Millions of people who have not yet visited Bermuda may think they know of Bermuda Shorts. But only the dress Bermuda shorts - what male Bermudians and professional business newcomers from all walks of life wear for business attire and cocktail parties - are the real Bermuda shorts, worn three inches above the knee. Wear them as a uniform, day day attire, informal evening wear, casual wear, walking out wear. They have been declared correct national day and evening attire for any non-formal occasion including meetings. But, to answer honestly the questions tourists and visitors in Bermuda always ask about where they are made, they are NOT made in Bermuda. Nor are the knee-length socks, or any other clothing, including the blazers or sport coats and shoes accompanying them. All are imported but sold locally under the names of the local stores by arrangement with the manufacturers. In the USA, one good place to buy them is from LL Bean. Some of the more business-wear kind may be imported in Irish Linen. Or try a lightweight blend of wool (surprisingly) and polyester. These latter may be washed in warm or cold water - never hot - and lightly ironed. There is little in price between the two types of materials, Irish Linen or wool/polyester. It is the name and the style - not where they are made (which is usually not in Bermuda) - that has made them famous. Avoid the polyester-alone ones, also washable and less expensive, but not authentic. In the James Bond movie "You Only Live Twice", Q is shown wearing a pair of Bermuda Shorts. Also wearing Bermuda Shorts is the boss (John Hillerman) in the 1980-1988 TV series "Magnum PI." Royal Gazette newspaper of Bermuda photo, above. The best quality Bermuda Shorts have a three inch hem, hand sewn, to hang correctly. Bermuda Shorts are garments for all seasons, representing a standard of turnout difficult to surpass in their originality. They are as well constructed as a good pair of trousers, complete with a proper fitted waistband or with belt loops or a self-supporting waistband and a seam in the center back. They are usually pleated for business use but a more informal variety can be unpleated. They usually have one pocket on each side and one on each side of the bottom. They are form-fitting, designed essentially for and can look very good on the slim or medium-built person. (Any with huge waists and bottoms will look far better in lightweight long trousers). 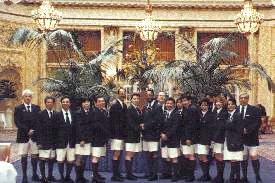 Accompanying them are Bermuda hose (imported long - knee-length - socks), plus a white or blue button down imported Oxford or other appropriate short sleeved shirt and conservative Windsor knotted striped or corporate insignia or club or regimental tie, with a single or double breasted navy blue blazer or a sport coat or madras or linen jacket that contrasts with the Bermuda Shorts. The most appropriate shoes are imported loafers with tassels - from the USA - in black or brown, depending on the colour of the shorts - to compliment and complement the Bermuda Dress Shorts. Most people wear them from April to November but some locals do so all year. They are not cheap - from US $55 a pair in Bermuda. This gives them a unique cachet, a reason to buy them not only for use in Bermuda but also to cut a dash when visiting another country. (Bermuda shorts are made for women too, of course, but they are not the national business dress for women. Bermuda Shorts for women are known as city shorts in America. They are of knee-length cut and similar to a pencil skirt). They are too good to be used as digging in the garden wear. Given Bermuda's very high humidity for most of the year, and the high temperatures from June to October - see Climate and Weather in Bermuda - they are very practical, very useful, very comfortable - and can also be very elegant. They are in various colors. Conservative colors are gray, beige or navy blue. But some prefer orange, pink, green or yellow. Newly arrived expatriate businessmen tend to go for the dark gray at first. Then they graduate to navy, dark green, burgundy, yellow and pink. They are not formal wear; there are no black formal Bermuda shorts; and that when invitations state formal wear, they exclude Bermuda Shorts and instead mean a tuxedo USA-style or its UK equivalent, a dinner jacket, with matching long trousers and bow tie. They are very rarely "on sale." Although they are not in any way suggestive, just smart by Western standards, some cultures do not accept them. For example, they are illegal in Iraq. The contingent from Bermuda always wear Bermuda shorts as their national dress at opening and closing ceremonies of the summer Olympic Games. 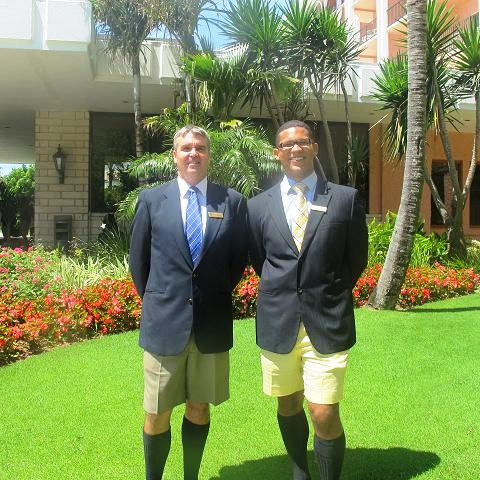 At Risk and Insurance Management Society (RIMS) conferences abroad, Bermuda delegates always wear official Bermuda Shorts ensembles. Bermuda Shorts advertised by Bermuda's Trade Development Board (later, Ministry of Tourism) in the 1950s. 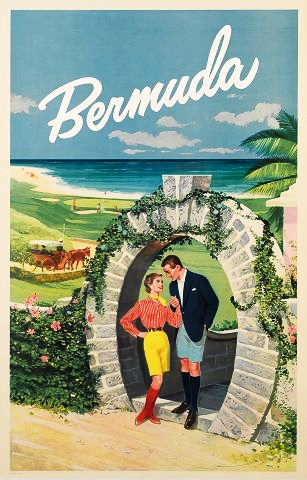 Poster shows Bermuda Shorts for a man and woman, at a Bermuda Moongate. Bermuda Shorts for men are not uniquely Bermudian, they were created at the turn of the 20th century originally by British military forces - and not in Bermuda, in London. By men in desk jobs whose function it was to see their soldiers and navy personnel were appropriately but lightly attired for duty at British Army garrisons and Royal Navy bases in tropical and sub-tropical parts of the old British Empire. With their already-issued tropical wear white shorts and long white stockings, the Royal Navy were probably the first to invent Bermuda shorts. They probably wore them when they founded the yacht clubs in the City of Hamilton and Town of St. George. Officers of British Army units serving in all parts of the old British Empire and elsewhere soon adopted - from the Royal Navy, not from Bermuda - the summer military version of the shorts, in khaki, with khaki knee length socks and highly polished brown shoes - or what became known in military slang as "brothel creepers," soft suede ankle high boots. Later, NCOs and private soldiers also wore the summer shorts uniform with long socks. Of course, British Regiments were in Bermuda, at the huge former Prospect Garrison in Devonshire Parish and also en masse at one time in the ancient garrison town of St. George until the 1950's and at Bermuda's many coastal forts in the 19th century and war years of the 20th century. 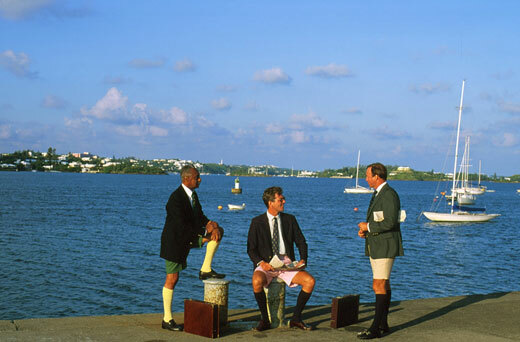 Bermudians began copying their very British style of uniforms in the 1920's, for civilian use. The 2nd Battalion, Green Howards (Alexandria Princess of Wales Own Yorkshire Regiment) was the first British Army regiment in Bermuda to have officially induced Bermudian clothing stores to copy the long-in-use summer warm-weather standard dress of British Army shorts and long socks of officers. Thus were "Bermuda Shorts" introduced to the world. Tailors in the city of Hamilton and the old town modified the garb somewhat and established it as the fashion. British tourists arriving by steamship for long winter holidays were the first to get into the style - and helped spread the fashion to the USA and elsewhere around the world. In doing so, they also helped to ensure that Bermuda Shorts became better known as casual wear instead of correct business attire by day and night. 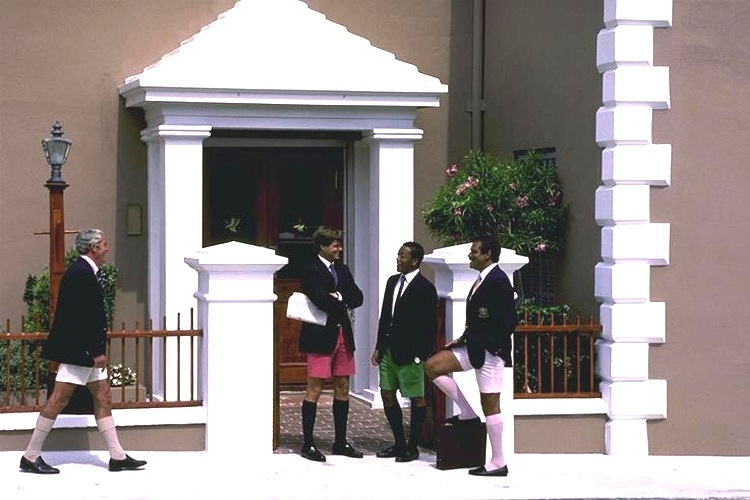 Then Bermudian businessmen got out of their wet long trousers in the heat of Bermudian late spring, summers and early fall, and into dry, airy, cool, Bermuda Shorts. They also added their own versions of the original British military knee length socks, also with the "turn down" at the top - but not in khaki, in colors borrowed from the distinctive long stockings worn for hundreds of years by the Scots - and sometimes with fancy tassels as well. They spurned the British style "brothel creepers" for American made loafers in brown or black, complete with tassels. They took to wearing a tie with a short sleeved white shirt - and added the jacket. Thus was the Bermuda Shorts ensemble born, in its absolutely correct completeness. A Pair of Bermuda Shorts was presented to His Royal Highness the Duke of Edinburgh during his visit and that of Her Majesty the Queen to Bermuda in November 2009. (British newspapers persist in using the wrong word as "Bermudan" (sic). The correct word and only word used in Bermuda is Bermudian - like Canadian, Floridian, Bahamian, etc). 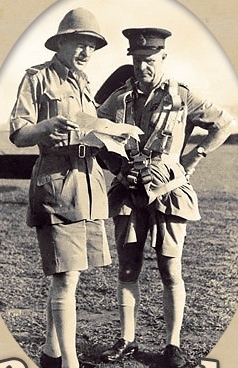 British Military shorts are still worn today! British military uniforms that gave Bermuda its Bermuda Shorts are alive and well. In Britain, Highland Scots units of the British Army still wear long stockings below their kilts, always with regimental garters. The Scots originated the idea of knee-length stockings, with garters or a tassel. In Cyprus, the British Army garrison wears the khaki shorts and matching knee length stockings, with hard, highly polished brown shoes for the non-commissioned ranks and suede "desert boots" or "brothel creepers" for the officers. On Royal Navy ships visiting warm waters, officers and men always wear white shorts, white knee length socks and white laced shoes - not the Bermuda, but the all-British - variety. Civilian shorts have been worn in the United Kingdom's warmer months for far longer than Bermudians and others have worn Bermuda shorts. Moreover, many of Britain's finest independent schools also wear long knee length socks with their shorts. It is very much a part of their tradition, especially at many of the preparatory or secondary (or both) boarding schools which are members by name and number of the Independent Schools Information Service (ISIS) in England.